Host sites are required to pay a loan fee, which covers shipping and administrative costs, and a refundable security deposit. Sites will receive an invoice for $1350 for large exhibitions (plus a refundable $250 deposit) and $450 for small exhibitions (plus a refundable $100 deposit). Fees are due no later than one month prior to the first day of the loan period—exhibitions will not be shipped to your site until the fee has been paid. Affiliate Schools and Public Library Affiliates are eligible to receive their first small exhibition at no cost. 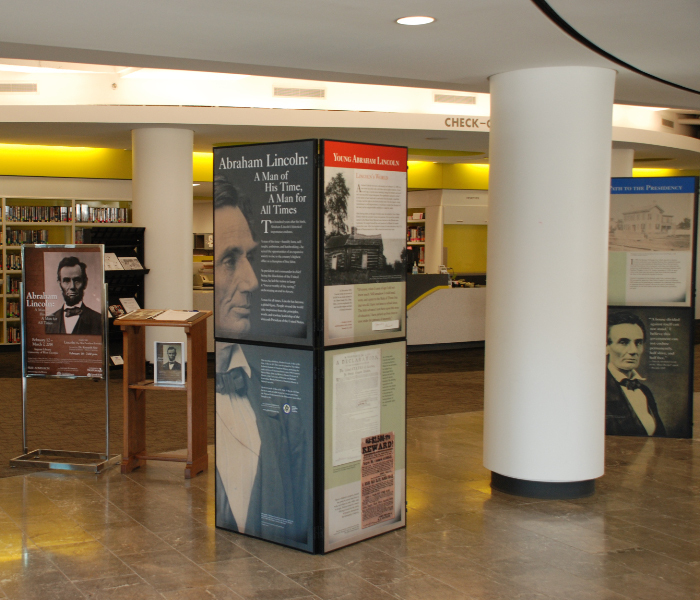 Small exhibitions include: Emancipation and Its Legacies; Frederick Douglass from Slavery to Freedom; Looking at Lincoln: Political Cartoons from the Civil War Era; Civil War 150; and The Progressive Era: Creating Modern America, 1900–1917. After hosting the first free small exhibition, Affiliate Schools and Public Library Affiliates are required to pay the standard loan fee and security deposit to host subsequent exhibitions: $1350 for large exhibitions (plus a refundable $250 deposit) and $450 for small exhibitions (plus a refundable $100 deposit). Traveling exhibitions are approximately 80" tall. Small exhibitions require 10–12 running feet of display space. Large exhibitions require 60–70 running feet of display space. Traveling exhibitions are freestanding and can be displayed in a horseshoe, pillar, or "running W" configuration. All exhibitions are sent via FedEx Ground. Exhibitions are shipped in high-impact, wheeled, plastic case(s). Dimensions per case are 33 inches x 44 inches x 10 inches. Weight per loaded case is 70 lbs. Tracking numbers and pickup confirmation numbers for both shipments will be provided by the Gilder Lehrman Institute. All shipping costs will be billed to the Gilder Lehrman Institute of American History. For more information, email Exhibitions or call 646-366-9666 ext. 41.